Large shrub or small tree to 20 m tall, trunk 10 - 40 cm in diameter Leaves: alternate, stalked, medium to dark green, 4 - 10 cm long, 2.2 - 5 cm wide, egg-shaped to inversely egg-shaped with a pointed tip and often heart-shaped base, toothed, covered with grayish white hairs while unfolding, remaining slightly hairy at maturity, with eleven to seventeen pairs of veins interconnecting near the margin. The fall color is a nice yellow to light orange to dull red. 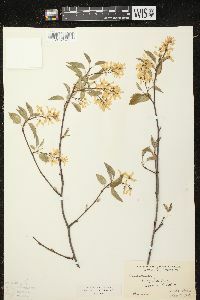 At flowering, leaves folded and covered with grayish white hairs. Flowers: borne in a terminal drooping inflorescence (raceme) 3 - 5 cm long, with each silky-haired individual flower stalk (pedicel) less than 2.5 cm long. Each flower is white with a reflexed, five-lobed calyx and five linear to narrowly oblong petals 1 - 1.4 cm long. Fruit: berry-like (pome), clustered on stalks usually shorter than 2 cm, changing from green to red to purplish black, 0.8 - 1.2 cm in diameter, spherical, fairly dry, covered with a light waxy whitish coating (glaucous), containing ten seeds. Bark: thin, pale gray and smooth with darker gray vertical (somewhat twisted) lines when young, becoming grayish to reddish brown with shallow vertical fissures, finally furrowed and scaly on vey old trunks. Twigs: slender, olive green to reddish brown, smooth. Buds: greenish yellow to reddish brown, 0.6 to 1.3 cm long, narrow egg-shaped to conical, sharply pointed, five- to seven-scaled, hairless or with white silky hairs at the tip and scale edges. Form: not colony-forming, with a slender trunk, narrow rounded crown, and many small branches. 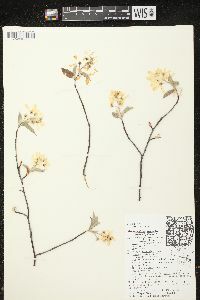 Similar species: Amelanchier arbora, Amelanchier interior, and Amelanchier laevis are the three Amelanchier species in the Chicago Region that are taller than 3 m at maturity. Amelanchier laevis has nearly hairless flower stalks that reach 2.5 - 5 cm in fruit, fruit that is juicy, and leaves that are half-grown, bronze red and more or less hairless at flowering. 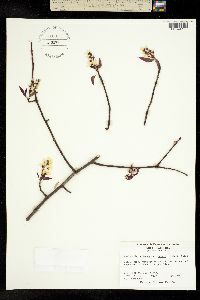 Amelanchier interior has hairless flower stalks reaching 4.5 cm long, eight to ten pairs of leaf veins, a densely hairy ovary, and leaves that are open, bronze red and more or less hairless at flowering. Habitat and ecology: Occasional on steep slopes, remnant pine barrens, mesic woods, and the high dune area. Etymology: Amelanchier is the old French name of a species in this genus. Arborea means "growing in a tree-like form." Known in Indiana as downy serviceberry or juneberry. This species is more or less infrequent to local throughout the state and is found generally in dry soil on the banks of streams, on wooded slopes, and rarely in level woodland. The stem is usually less than 2 inches in diameter.